I've referred to it may times to see if someone is close to the expected values of a particular saltmix. There can of course be slight variations and if any settling has occurred in the mix before use can cause results to be even farther from the normal numbers. There's threads all the time with people testing their new salt mix but seems like its always when there's possibly a problem with it. I'd like this to be a thread of new batches of salt mix tested when there aren't any problems. Get a good array of tests done on different brands. Then compare each one against the original synthetic saltmix parameters thread and compile a set of averages for a particular brand and compare. Just basics like temp, salinity, alkalinity, calcium, and magnesium. Or at subset of those three but I think temp and salinity level should be published with all the posts. Giving what was used for the testing would be nice too. My tests done tonight from my New Salt mix brute. This should be interesting. I've thought about doing another study like the older one, but I've been too busy. I'm in. Next mix I'll post. As you I use IO nothing added. Curious to compare results. To make this as accurate as possible, It wouldn't be a bad idea to make sure the dry salt mix has been thoroughly mixed before using, to eliminat any possible elemental stratification that may have occurred during shipping. Make sure you're adding the mix to the RO/DI water, and not the water to the mix. 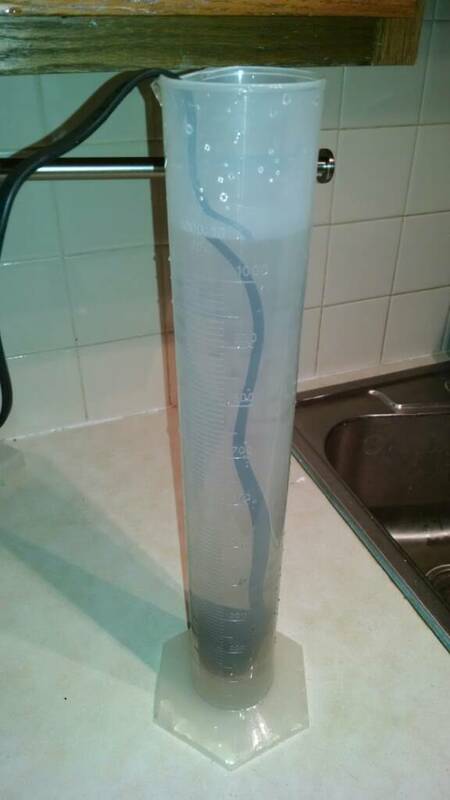 Allow the ASW to mix for at least 4 hours before taking any measurements, to ensure a good mix. 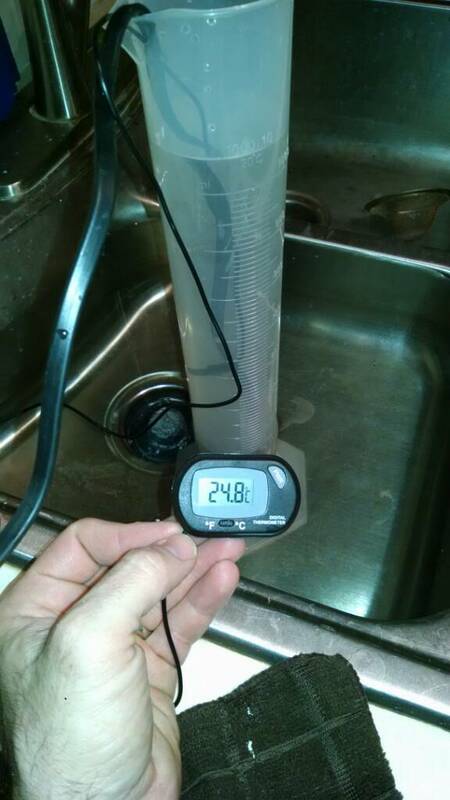 Use a properly calibrated salinity measuring device, i.e. Refractometer calibrated with a 35ppt solution, not RO/DI or distilled water, or a probe calibrated with a 53mS solution. If using another type of device, make a note of it. What kits were used to measure the Ca, Mg and Alk. 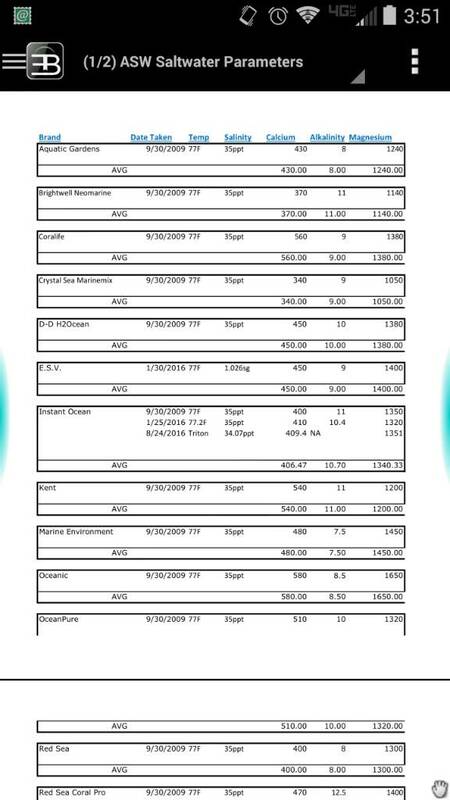 Salifert results are average of 3 consecutive tests. Fairly consistent results with the last 3 buckets of Tropic Marin Sea Salt. Mg is less than I like but I bump up MG to 1300-1325 prior adding it to tank. IO Reef Crystals mixed with RO/DI and circulated for 24 hours. But You Can't Make Him Look In Your Mouth." there used to a be a sticky around here with all the brands and specs listed not sure were i saw it. that what your talking about? That list is far from accurate anymore. The composition of most of these salts has been changed many times since then. Very rough guide at best. I know! That's why I tested it 3 times. Makes sense to me though because my alkalinity always reads way high in my tank water. Yep, it's the link in the first post of this thread. or different parameters. It still is a good reference as many salts if changed haven't changed that much. But we will see what the average pulls over time. RC is known to have fairly high Alk. That number doesn't surprise me. Good if you find Calcium and Alk is depleted at a high rate and reduces the need to dose those two as much or at all. So, any new updates or additions I'll be adding to a spreadsheet. Anyone that doesn't want to post in this thread can always PM me results. And yes this is just for a rough idea of what could be expected from a particular salt mix. Going to start testing myself one brand at a time. Like one a month. Probably starting soonish. 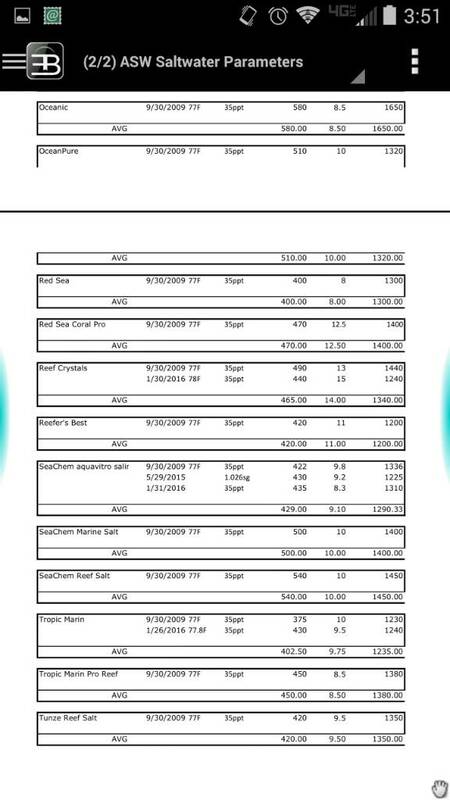 Anyone else like to add their results please feel free to post here or PM me. And I guess I could link here to the test kit reviews I've done and recommend. A PO4 test kit shootout between Nyos, Elos Pro, Salifert, Hanna Checkers x2, and Seachem. Last edited by jason2459; 02/19/2016 at 03:14 PM. Need to get this thread updated. The past week I've been nailing down procedures to be able to consistently be able to test various brands of salt. I'm getting this ready to start testing a bunch of saltmix brands. I guess kind of like a saltmix shootout. Just to check and adjust temp a super cheap digital thermometer but has always been consistent. I remember it being ever so slightly high. 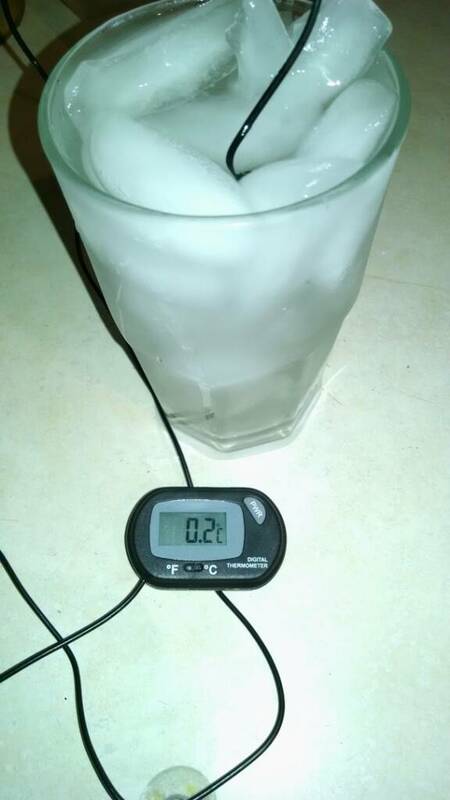 Double checked to night with a quick ice water test. And I'll be targeting 25C. As from late fall to early spring my house is around 65-68F. But late spring to early fall could be around 80F. I figured 77F/25C is a good middle ground I can easily adjust to. And a super easy way for me to adjust temp hotter or colder.... My kitchen sink. I just filled it with warmer water. In hotter temps I'll fill it with colder water. Then I'll use my pin point salinity probe to monitor when I hit the desired levels of 35ppt or 1.0264. And use my veegee refractometer as a cross check as well. I'll calibrate or at least check both for calibration before hand. I figure I'll try and calculate what the manufacturer suggests to get to that salinity level in 1000ml and make note of how much was actually needed or if it exactly as indicated. Then I will test for Calcium, Alkalinity, and Magnesium using Salifert kits. But 1L proved to be to small a volume. So, moved up to 2 gallons and that seems to have done it. My process going forward will be to check for calibration or calibrate if required both my veegee/vitalsine refractometer and pin point salinity probe. Thoroughly mix the dry salt mix. Slowly add in salt over 1 hour period to 35ppt. Mix dry salt between 1/4 cup scoops. Once 35ppt is reached wait 45 minutes. Take Alkalinity, Calcium, and Mg Tests all with Salifert kits. This is from 1 bag. There can be variations from bag to bag of course but I would feel comfortable saying the 2009 results are still correct for at least IO. I have also sent a sample off to Triton to cross check my results. It cracks me up when people think the salt mix is like cake batter and need to mix up the dry salt mix, like you could really could mix up separated elements equally. All the salt mix I've ever used started out as a liquid; whether natural, synthetic, or enhanced. Then it is evaporated which makes each granular a complete saltwater chain, the elements do not separate. If you purchase salt mix that is of separate elements you would have to mix the entire batch for it to usable. Anyone that gives you information about rolling a bucket around or shaking up the salt mix to mix is just to cover up poor quality control. 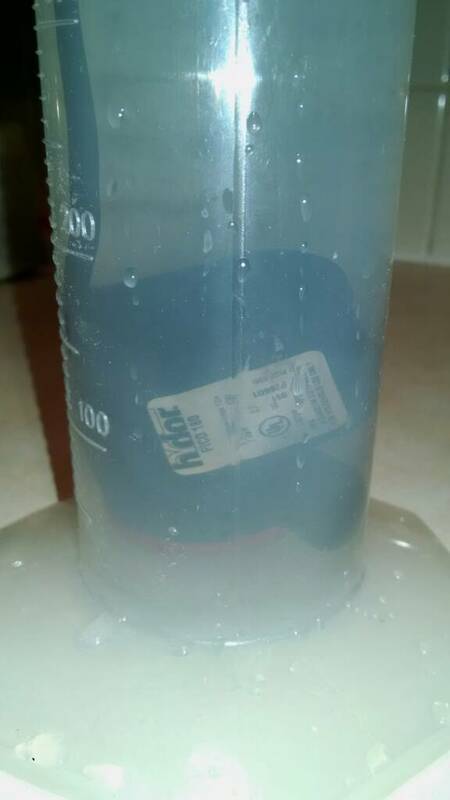 Most of the time we add to the inconsistency and precipitation by the way we mix and test our own water. Sorry, but that is wrong. Salt that is gathered through drying is not complete. Saltmixes that we buy is added to and attempts to meet some kind of objective. Some are to meet natural saltwater parameters. Some for corals. Etc. Which is why most all saltmix brands we buy vary from one another on one and often way more then one element. And yes, stratification can, has, and does occur. Here's a start for something to read. The salt products we use are based on evaporated saltwater, in some sense, but that's probably limited to the NaCl component. The rest probably comes as separate ingredients or as contaminants. Drying saltwater converts a lot of the calcium and carbonate or bicarbonate into sand. The sand won't redissolve, so there would be no carbonate alkalinity in dried saltwater. oh I forgot how many real chemist and biologist are on this board, I still find it funny how you think you are going to shake a bucket and evenly mix all the elements. Would you care to troll another board then?